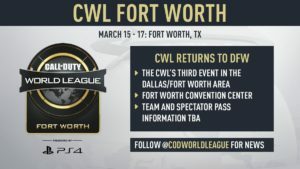 Once again, the CWL is hosting an event in Fort Worth, Dallas, Texas with the world’s best Call of Duty teams aiming to prove their worth and earn their share of the total $400,000 prize pool. The open event expects to see 256 teams in competition, including an amateur segment (the open bracket) which will be open only to teams not in the Pro League. This Open bracket will make up a fair wedge of the prize pool – $75,000. Last year, Team Kaliber took home the grand prize in Dallas, the team then consisting of Dylan “Theory” McGee, Lamar “Accuracy” Abedi, Martin “Chino” Chino and Kenny “Kenny” Williams. With Theory now in retirement, Chino back in the amateur circuit and Accuracy and Kenny spread across Splyce and 100 Thieves respectively, will we see one of these guys return with yet another win? Groups haven’t been announced yet but we’ll make sure to update this page as soon as we know any more.